Bertrand's Printing & Office Supplies, Inc.
Aswell Bertrand was the founder of Bertrand’s Printing. In the year of 1934, he started as a “Printer’s Devil” in the New Era, the newspaper of Eunice at that time. Aswell joined the late Willis (Vic) Johnson in 1938, staying 22 years with Johnson Printing Office, in which he became a partner. 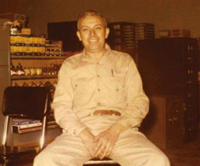 In 1960, he broke away and started a his own print shop in his expanded garage at home on 8th street along with his wife Annabelle and six children. In 1965 he bought Harrison Hebert’s printer. 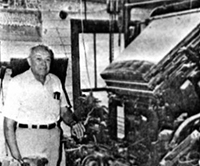 At this time John “Lapan” Bertrand joined in with offset printing taking over printing. Willis Bertrand then joined in along with his wife Mona. Richard Bertrand opened the office supply store on 2nd street in 1974 along with Pat, Lapan’s wife . The office supply grew and moved to the present location at 115 south 2nd street. The print shop added more to the shop and took parts of the family house. After Mrs. Annabelle Bertrand passed away in 2009, the print shop took over the entire house and Jason Bertrand, Willis Bertrand’s son, joining the print shop working on digital printing/color copy service. The print shop is operated by Willis and Lapan Bertrand along with Jill Bertrand, daughter of Lapan Bertrand, Jason Bertrand, Menette Vienne, Jenny (Po Bear) Miller, Liz Ardoin and Amie Brown. The office supply is operated by Richard Bertrand along with Amy Smith, Ryan Vienne, and Denise Fruge. Justin Rosenber is the delivery man for both locations. Bertrand’s Printing & Office Supplies, Inc. has served Eunice area with quality printing and full line of office products since 1960. We now offer a large inventory and overnight trucking at 115 south 2nd street in Eunice and in-house print shop with letterpress, offset and color digital printing. © 2012 Bertrand's Printing & Office Supplies, Inc.